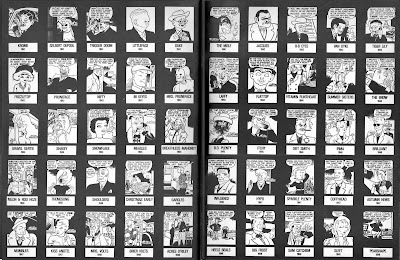 From gag cartoonist Eli Stein's blog comes a story of National Cartoonist Society members meeting with President Eisenhower in 1954. They made Ike an honorary member and gave him a presentation book of 95 cartoons. 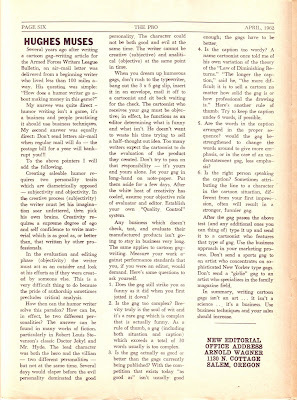 A couple of years later, to help sell war bonds, the book was reproduced as a promotional item. 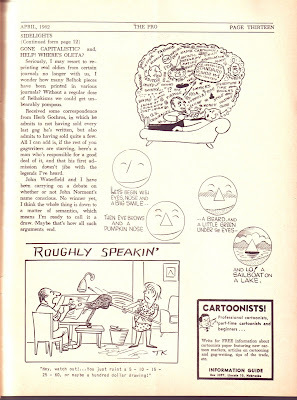 Eli shares some gag cartoons from that book here. I believe this was when Ike received the Silver T-Square from the NCS. The Silver T-Square, "awarded, by unanimous vote of the NCS Board of Directors, to persons who have demonstrated outstanding dedication or service to the Society or the profession" was also awarded to one other President: Harry S. Truman, in 1950. More infomration on the NCS Awards page. "I've written strips without any malice in my heart and I've been ripped apart by readers who took offence. I written strips that I thought would evoke an emotional, political response . . . not a peep. 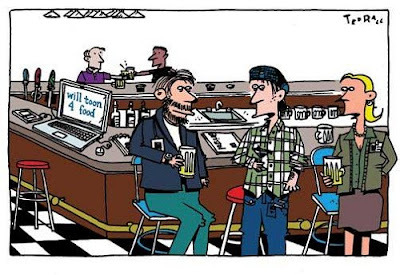 I've written strips that I felt really weren't my best work but had to send them in anyway because of a crushing deadline and been inundated with mail from readers who loved them." 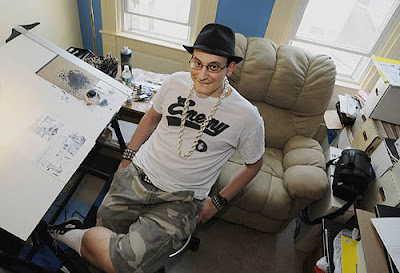 "Recently, I received a request from Jackie Alcock, an artist who lives in Corner Brook, Newfoundland. She was creating a visual arts piece called 'The Buffet Table' representing arts and crafts and women's history. She asked if she could use frames from the grandmother storyline to make "doughboys". It's one of the more unusual requests I've had but I was very pleased that she thought of the story line." Below is a video showing some of the process. 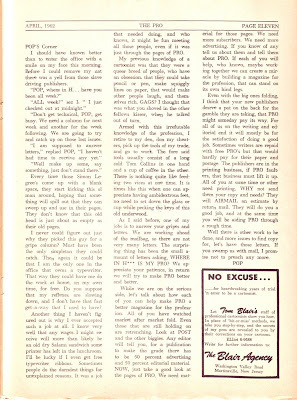 The whole story is at the BETWEEN FRIENDS blog. 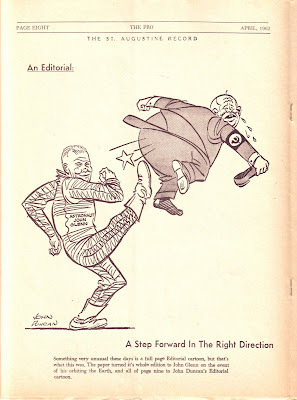 Should the American Association of Editorial Cartoonists and the National Cartoonists Society merge? 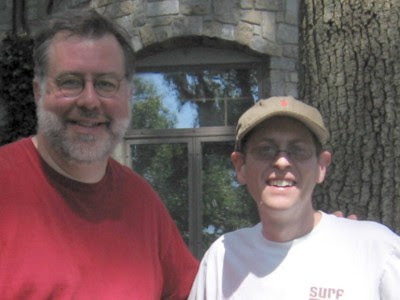 AAEC President Ted Rall has put the idea forward for discussion, and Daryl Cagle, former NCS President (as well as an AAEC member), weighs in on his blog. Above cartoon copyright 2009 by Ted Rall. 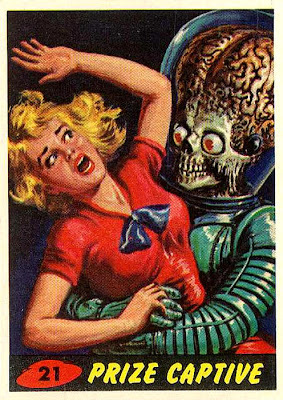 Harry Lee Greene at his Hairy Green Eyeball blog gives us the compleat Topps bubblegum "Mars Attacks" series of 1962 trading cards. Oo la la! Artist Jeff Koons exhibits his "Popeye series" at London's Serpentine Gallery from July 2nd to September 13th. The Guardian has a preview today. King of kitsch, Jeff Koons, comes to the Serpentine Gallery this summer with his first ever solo British show. 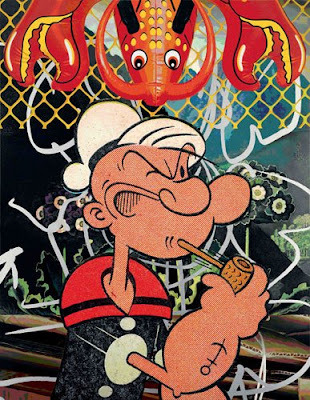 Work by the American artist, who will be exhibiting his Popeye series at the Serpentine, 'creates a world beyond taste' according to the Guardian's Jonathan Jones. Preview highlights from the exhibition (which runs from 2 July until 13 September 2009), before it opens to the public. 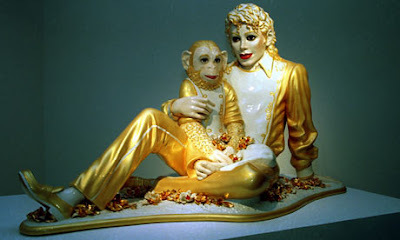 Jonathan Jones, writing for The Guardian, comments that Koons "creates a world beyond taste." 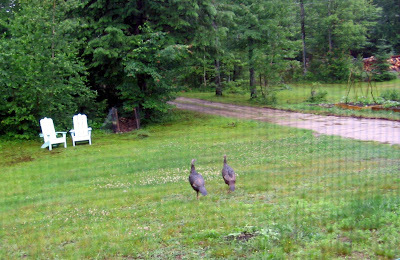 These two are coming every morning between 7 and 8am; two turkeys, a girl and a boy turkey, waddle into the yard, getting quite close to the house. After some pecking and gobbling, they hurry along, into the woods. The female, I've noticed, always leads. Photo taken by me this morning through the window screen. Above: a LOCKHORNS bisque at the home of Bunny Hoest. I left my house on the New Hampshire ridge for a quick overnight trip to New York. 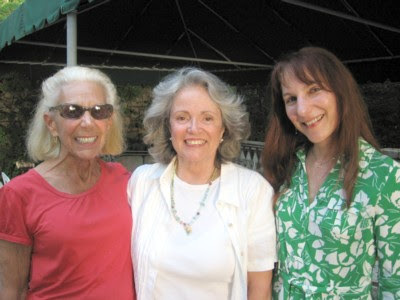 Object: drive to Bunny Hoest's home on the Long Island North Shore, arriving by noon for the annual Bunny Bash. Thanks to a wee hours start and the Bridgeport/Port Jefferson ferry, I made it. Today, the house on the Long Island sound is finished, and the event has grown. About 150 cartoonists, spouses, kids and friends got together for what turned out to be a partly cloudy afternoon of shop talk. 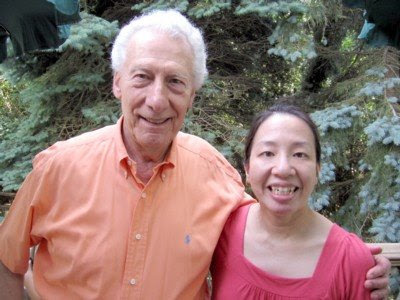 King Features' MARY WORTH creative team of Joe Giella and Karen Moy. 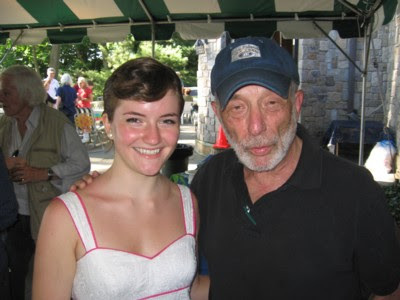 ARCHIE's Stan Goldberg with KIM POSSIBLE's Stephen Silver. 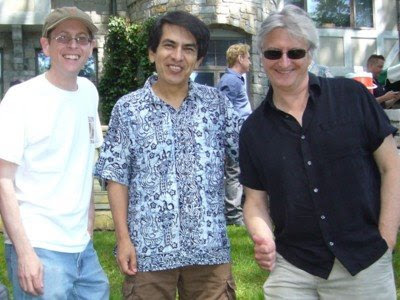 New Yorker cartoonists Robert Leighton and Felipe "Feggo" Galindo, with illustrator Martin Kozlowski. Thanks to Felipe for this photo! 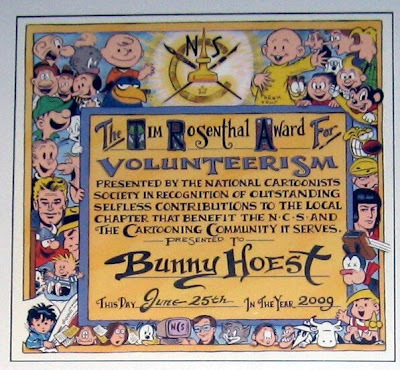 NCS Chapter Chair Adrian Sinnott and National Rep Mike Lynch surprised Bunny Hoest with a National Cartoonists Society Tim Rosenthal Award for Volunteerism. Above is the award, gorgeously drawn by Guy Gilchrist. Tim Rosenthal was Head of Syndicate Services at American Color. 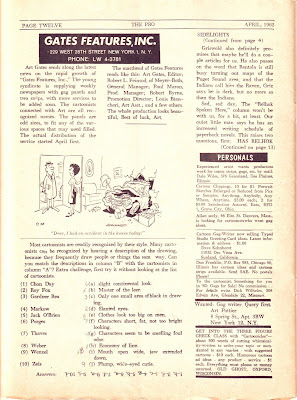 American Color is the place where many newspaper comics are colored and then sent to papers around the world. 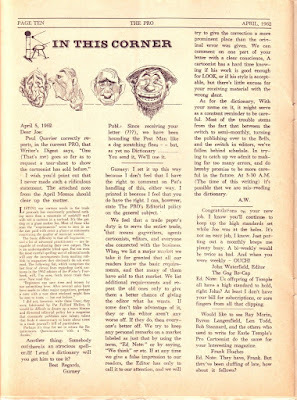 His impact, developed with Wiley Miller, on the way color is used in newspaper comics, set a new industry standard. 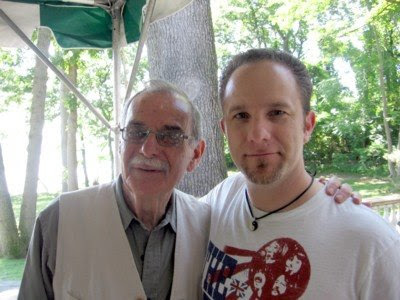 He was also a big NCS supporter, and a good friend to many cartoonists. Everyone knows that Bunny works for King Features. Everyone knows that Bunny works for Parade Magazine. 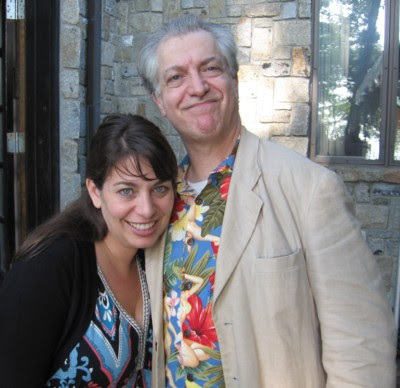 What everyone may now know is that she also works very hard for the Long Island chapter of the National Cartoonists Society, helping with the award voting, as well as hosting the annual Bash. 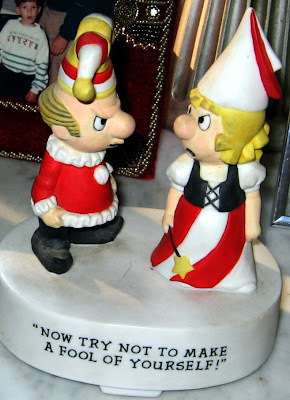 She is, as Creig Flessel described her, the "Den Mother" of the Berndt Toast Gang. This was a small token of appreciation from her NCS family. If anyone has a photo of Bunny with her Award, please share it with me. Thanks. 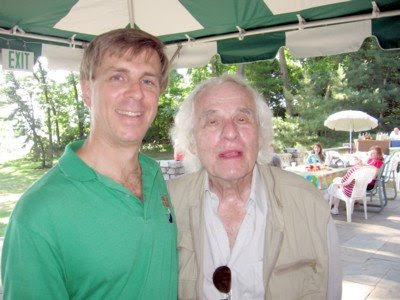 Mike Lynch, with my friend, The New Yorker's Robert Leighton. 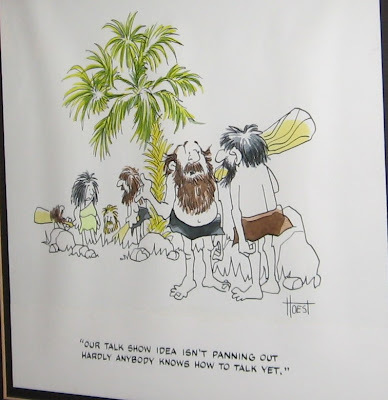 A framed gag cartoon of Bill Hoest's. One of many decorating the "Hoest Castle" interior. 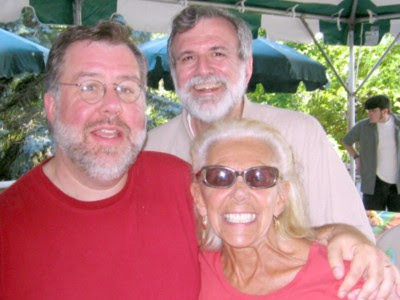 Dotti Sinnott, daughter of Berndt Toast Gang Chairman Adrian Sinnott, and the one and only Sam Gross. I wound up staying very late, as did a few others. Bunny ordered pizza. 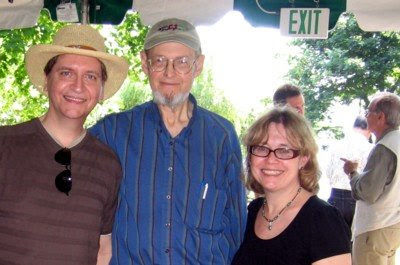 I shared long conversations under an orange sliver of a moon with Adrian Sinnott and his family, Bunny, John Reiner, Mort & Barbara Drucker and Stan & Pauline Goldberg. I had a memorable time. Exhausting, but memorable. 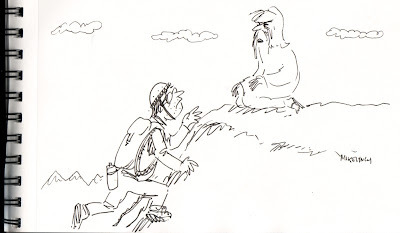 "I have no funny secret of life gag line for you because the cartoonist has gone out of town. Thank you. Come again." Have a wonderful rest of the week. I'm off to hike the Appalachian Trail. Or Argentina. 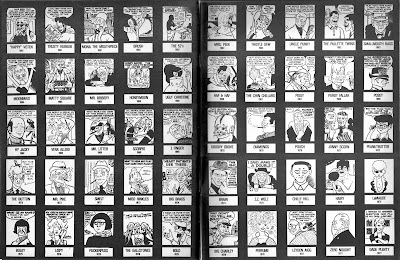 Stephanie Piro, on of my favorite cartoonists (and not just because she says nice things about my sketchbook), talks about Bringing Cartoons to Life at The Six Chix blog. 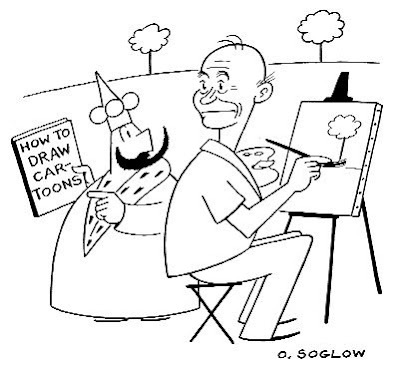 I love learning about other cartoonists' processes. "When I work… I have to practically use stick figures, and as you’ll see, these may be one step ahead. "I have to prevent myself from drawing anything too good…because then it will intimidate me, and I will never be able to redraw it as a finished piece, because I’m too happy with the rough. Odd, I know, but we all have our quirks. And some might say 'Too good???' 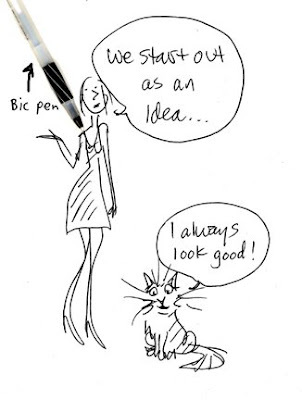 When I sketch I use a Bic pen or whatever is lying around and I write (and draw and everything else) on copy paper." One of my favorite shows is the BBC TV series GAVIN AND STACEY, about 2 twenty-somethings who meet and fall in love. It's sweet, but grounded in real-people behavior. And the first series is out on DVD now. In the clip below, they are finally meeting in person after months of talking on the phone. They are nervous and have both brought their mates, Smithy and Nessa, to the first meeting. And we all know a guy like Smithy. A couple of the supporting characters, Nessa and Bryn (along with Sir Tom Jones and Robin Gibb), did a fun video for Comic Relief: Barry Islands in the Stream. The series is worth a look. It's available on iTunes. USA Today gives a series of "exlusive [sic] photos from director's Tim Burton's upcoming reimagining of Alice in Wonderland, in theaters March 5 ." "'We finished shooting in December after only 40 days,' [producer Richard] Zanuck says. 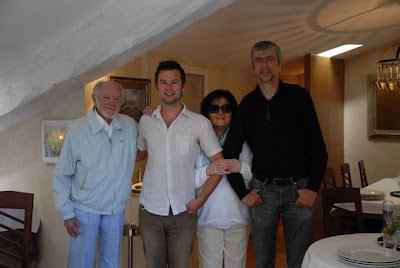 Now the live action is being merged with CG animation and motion-capture creatures, and then transferred into 3-D."
Animation artist Matt Jones blogs about his visit with Ronald Searle and his wife at their home on the French Riveria. By Tony Norman, in today's Pittsburgh Post-Gazette. 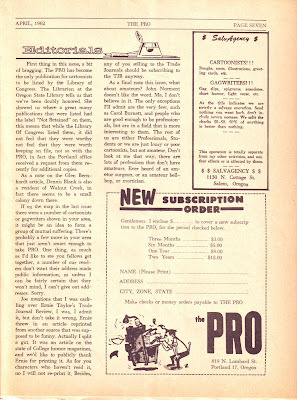 A profile of Ed Piskor and the effect that a gushing review in Wired had on his self-published comic. Samples at the above link. Hat tip to Dad for this! Thanks, Dad! 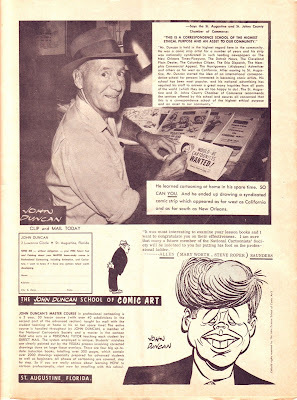 Sherm Cohen shines his Cartoon SNAP blog light on John Stanley's short-lived AROUND THE BLOCK WITH DUNC AND LOO comic book series. 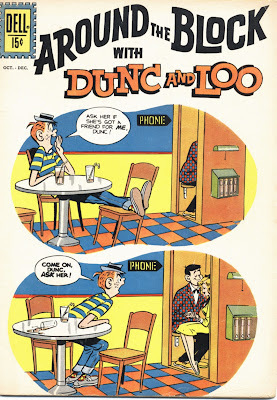 This is great comics, you betcha. And, like Sherm, I'm reading the new MELVIN MONSTER book, reprinting the prolific Stanley's 1960s comic book of the same name. Thank you, Sherm, for sharing this! 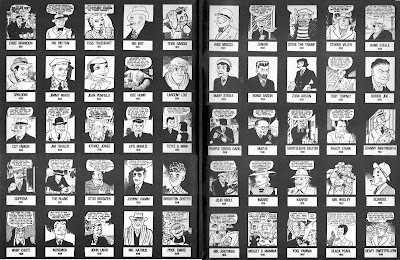 1300 pages of scans of comic book pages by Jack Bradbury are at the Comic Art of Jack Bradbury site. Lovely, animated work, with a vibrant ink line from his 1940s and 50s comic book work -- and if you don't know Bradbury, now you have no excuse. Above Times photo of Mr. Bradbury by Ethan Pines. The NY Times' Jennifer Steinhauer profiles Ray Bradbury's fight for H. P. Wright Library in Ventura County. 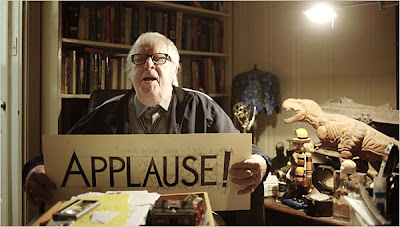 "'I don’t believe in colleges and universities,' Ray Bradbury, 88, said. 'I believe in libraries.'" 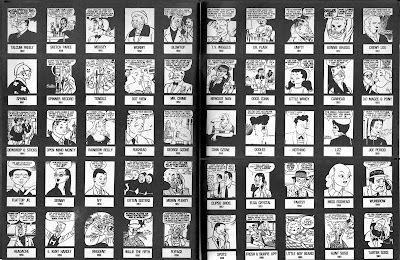 Ziggy Cartoonist Tom Wilson on the syndication and licensing of cartoons in the face of an economic downturn. 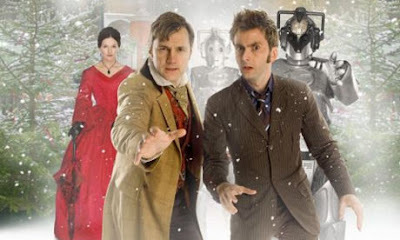 Above publicity shot from "The Next Doctor" grabbed from The Guardian's Media Monkey. 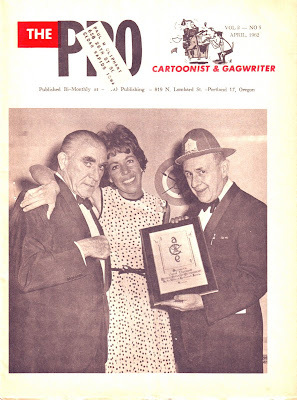 Above "This is an exclusive photo of TV comedienne Carol Burnett receiving the NCS ACE (Amateur Cartoonist Extraordinary) award from Albert Dorne, President of the Famous Artist Schools (left), and Bill "Smokey Stover" Holman, President of the NCS. 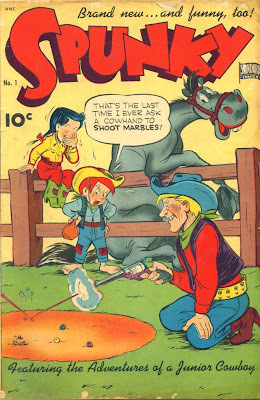 Carol, now a home-study cartooning student of the Famous Artist Schools, has always wanted to become a cartoonist and do a cartoon strip." 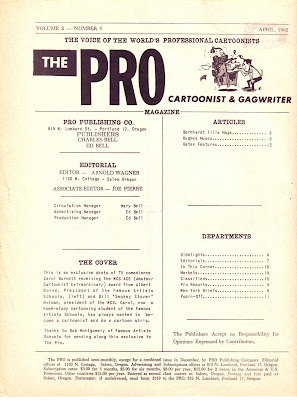 Here is the late Arnold Wagner's prozine The PRO Cartoonist & Gagwriter, Vol. 2 No. 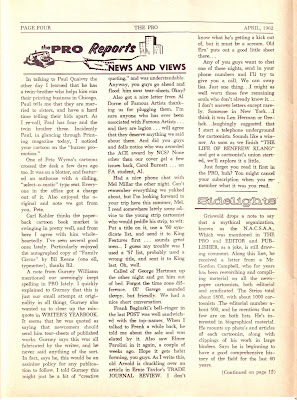 5, April 1962, scanned in its entirety. 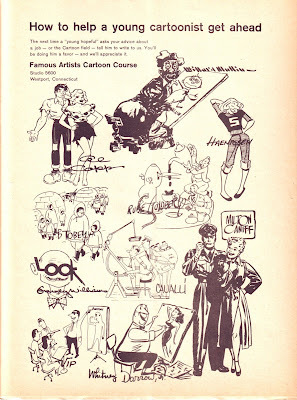 The year after this, the ACE Award went to Hugh Hefner, another wannabe cartoonist! Other recipients include Jackie Gleason, Orson Bean, Robert Lansing, Rita Moreno, Ginger Rogers, Al Roker, Denis Leary and, most recently, in 1998, Morley Safer. 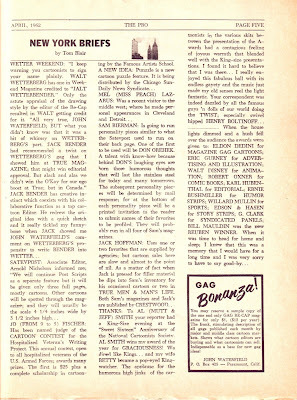 [Editor] SAM BIERMAN: Is going to run personality pieces similar to what the Satevepost used to run on their back page. One of the first to be used will be DON OREHEK. 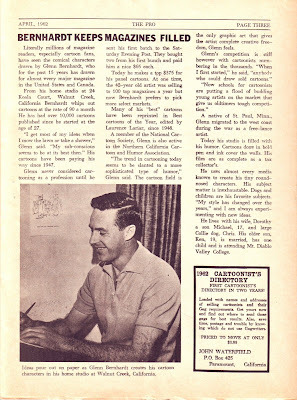 A talent with know-how because behind DON'S laughing eyes are born those humorous thoughts that will last like stainless steel for today and many tomorrows."